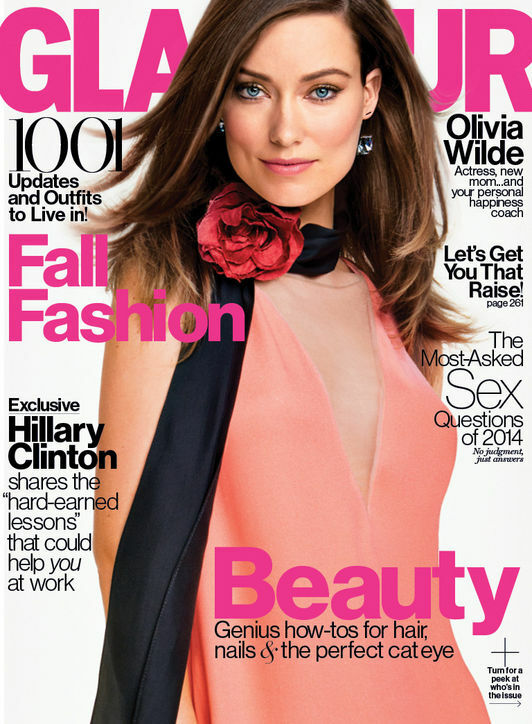 Cover Craze: Olivia Wilde for Glamour’s September 2014 Issue! It’s about that time of year when not only is fall fashion hitting your favorite stores, but also the magazine racks with the coveted September issues, thriving with new outfit options for the changing of the seasons, as well as the trendiest new pieces to transform & upgrade your style. Actress Olivia Wilde graces the cover of Glamour, discussing her upcoming 30th birthday, her newest role as motherhood to baby Otis (with fiancé Jason Sudeikis), changing how women are perceived in the film industry, & her latest HBO project with Martin Scorsese. However, it’s time to talk about the fashion shoot, under the direction of famed photographer Patrick Demarchelier, Olivia’s cover look is romantic in a Lanvin dress & Dior flower scarf. Other looks in from the shoot include Louis Vuitton, Prada, Roberto Cavalli, & Dolce & Gabbana, aong with accessories from Echo Design, Jennifer Fisher, & Yossi Harari. For the complete interview, check out Olivia’s candid remarks on Glamour‘s website. Which look from the shoot is your favorite? Who do you love to read about in magazines? Which is your favorite magazine for the best style inspiration? For more gorgeous images to add to your Pinterest, check out previous posts including Lauren Conrad’s newest collection for Kohl’s, how to get Chloe Grace Moretz’s recent red carpet look, & a great deal on a chic Calvin Klein dress. Happy Styling! This entry was posted in Cover Craze, Magazine Must-Haves, Style Darling Daily, Super Style Wishlist and tagged Cover Craze, Dior, Dolce & Gabbana, Echo Design, fall fashion, fashion, Glamour, Jason Sudeikis, Jennifer Fisher, Lanvin, Louis Vuitton, Magazine Must-Haves, Martin Scorsese, Patrick Demarchelier, Prada, Roberto Cavalli, September issue, Style Darling Daily, Yossi Harari. Bookmark the permalink. ← Runway Rundown: Lauren Conrad’s Newest Collection for Kohl’s!